From lounger to rocker - all in one smart seat! 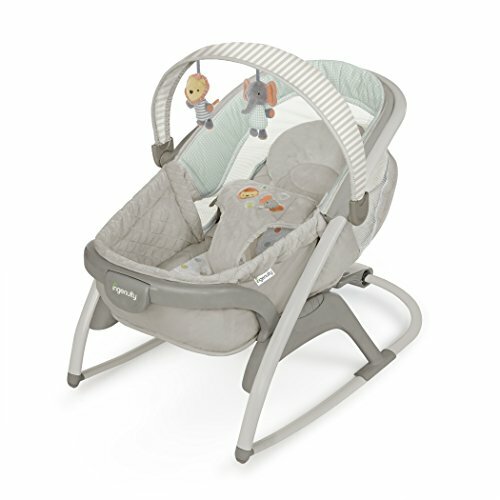 The Ingenuity ConvertMe Rock 'n Sleep Seat- Everett easily converts from lounging bassinet to a rocking seat for play time. The deep cradling seat and plush seat pad offer a removable head support to keep baby comfortable and supported. The pivoting toy bar includes 2 adorable plush toys and removes to make it easy to reach baby. Soothe baby with 7 melodies, nature sounds and vibration with 25-minute automatic shut off. Seat pad is easy to clean and the 3-point harness is adjustable. Designed with parenthood in mind.